We had a great experience in Jarabacoa! Everything you organized exceeded our expectations. Our transportation and hotel were excellent & the best part was the Pico Duarte climb. We really liked our guide & he allowed us to climb at our own pace & we summited on the first day, in 5 ½ hours. The lodging & food on the mountain were great. We couldn’t have asked for anything better! I would highly recommend your services to anyone & have said so on my Twitter account! 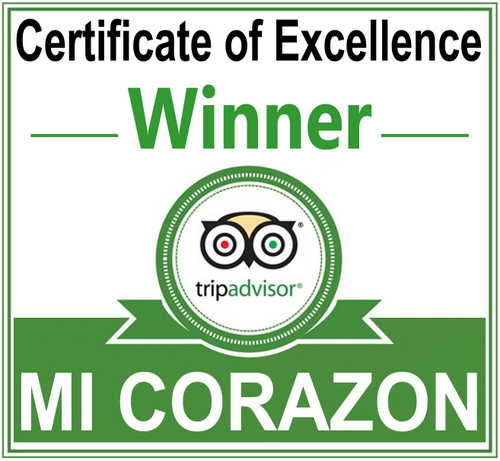 We had the pleasure of both dining in the Mi Corazon establishment and having Daniel and his staff cater our wedding. We could not have been happier with our decision. Planning our wedding from Calgary made it somewhat nerve racking when deciding who to go with sight unseen. Daniel was more than accommodating and suggested we come for dinner prior to our wedding to experience what Mi Corazon offers and Wow were we impressed. The restaurant itself reminded me of an old Spanish courtyard, it was beautiful. We were a group of six and we all tried the tasting menu and we were all impressed with the presentation and quality of our dinner. We assumed our wedding meal would be of the same caliber but our expectations were exceeded, it was absolutely amazing. The courtyard appetizers (Ceviche, mini quiche, chicken skewers, etc ) were all exceptional, as were the staff serving them. Daniel saw to every detail and our guests were all very impressed. We opted for the plated sit down meal as we were a smaller group of 40, and we chose the Tuna Steak. The tuna was done to perfection and the presentation was top notch. We would not hesitate to recommend Mi Corazon for a romantic or family in-house dining experience, and if your thinking of a wedding or celebration ceremony in Las Terrenas we would highly recommend using Daniel and his staff, the certainly helped make our day memorable. I had the time of my life celebrating my birthday in the Dominican Republic. With the help of Lara, I got everything I asked for the price I wanted! You will not be disappointed with this business helping you with your travel plans. Mi Corazon catered my friends wedding — amazing! There was such much to choose from. Even though the wedding was in a villa, the presentation was beautiful. The steak was cooked to perfection — I typically don’t like medium cooked but it was SO GOOD! The rice was yummy as well as the potatoes and rolls. Definitely give them a try! I recently had my wedding catered and decorated by the wonderful staff at Mi Corazon. I was doing the entire planning from across the world and they ensured every single detailed was met to the t’. Daniel and Montserrat were amazing and truly nailed my special day! I couldn’t have done it without their help and knowledge. The food was so delicious! The quality and freshness was outstanding! The dessert table was to die for!!! If I ever host another event in Las Terrenas, I would not hesitate to contact them again!!! Loved their professionalism and outstanding demeanor. This year at Christmas we rented a house in Las Terrenas for the whole family, children and grandchildren. When all was settled we decided to surprise them and get married (after 30 years together). Quite honestly this would not have been possible without the help of MI CORAZON’s team, they simply went out of their way to help with every single details. We wanted something very simple but elegant and this is what we had. They helped us hired someone for the decoration (Nancy , she was perfect) and Daniel planned the meal: appetizers and champagne after the wedding on the beach and a wonderful reception at the restaurant. The food was just stunning and delicious. We very strongly recommend this restaurant for their service, it is more than what you can expect. Thank you so much Daniel! They catered a wedding in our villa and the service and food was impeccable. Thank you! Would definitely recommend and use again. Daniel and his restaurant, MI CORAZON, are simply fantastic. We selected Daniel to cater our wedding based on the glowing reviews of his restaurant as well as recommendations from others. We had an intimate wedding reception of 24 people with a full service cocktail hour and dinner reception handled by Daniel’s professional staff. Daniel planned and coordinated everything from the cocktail hour and dinner reception, including dessert, to the timing, delivery and staff resources. He communicated with us from the beginning through to the end. He was well organized throughout the entire process as well as on the day of the event. Daniel paid attention to the details and double checked everything before finalizing the plan. He helped us manage our guests’ food sensitivities and offered us suggestions and options. Daniel also made recommendations for beverages as well as suppliers. He allowed us to customize our menu to meet our desires for our wedding day. His staff handled the food and drink service with professionalism and treated our guests with respect. Our interactions with Daniel were nothing but positive. His chefs created wonderful tasting dishes from high quality ingredients that all of our guests raved about. In fact, many of them saved their leftovers for later. The portions were generous and there was a nice variety in the courses. The presentation and plating of the dishes was on par with other fine dining establishments. Overall, we highly recommend Daniel and MI CORAZON. Thank you, Daniel, for helping us having such a delicious wedding! We chose MI CORAZON for our wedding in Las Terrenas in December 2013. This was the best choice we’ve ever made. We are so happy we met them, they made an incredible dinner for our wedding that everyone loved. We also had the chance to go to the restaurant in June. Definitely one of the best food we had! The owners [Daniel & Lilo] are the most sympathetic people, we recommend everyone to go there and see by themselves. One must-do in Las Terrenas, and the restaurant is so beautiful! Villa Sofia exceeded all my expectations, not only with the perfect location seconds from the beach and a short drive into town, but also with the professionalism of the host and staff! I celebrated my small wedding reception and the host put me in contact with the best wedding planners in Las Terrenas. The staff Josefina, Juana and the gentleman who helps keep the grounds clean they were outstanding and personal. The breakfast was 5-stars and the dinner was great! I couldn’t have asked for a better place to host the most important day in my life and it couldn’t have had been possible if I did not have such a great team assisting me with details and information! The villa is spacious, clean, and very accommodating. Cannot wait to come back!!! I recently had my wedding catered and decorated by the wonderful staff at MI CORAZON. I was doing the entire planning from across the world and they ensured every single detailed was met to the t’. Daniel and Montserrat were amazing and truly nailed my special day! I couldn’t have done it without their help and knowledge. The food was so delicious! The quality and freshness was outstanding! The dessert table was to die for!!! If I ever host another event in Las Terrenas, I would not hesitate to contact them again!!! Loved their professionalism and outstanding demeanor. In February, 2018 our family came from the U.S. to celebrate a wedding in Las Terrenas, Domincan Republic. When we hosted the rehearsal luncheon, we were exceptionally pleased with the catering services provided by “Wicked Events- Mi Corazon Catering”, under the direction and supervision of Ms. Laura Aybar. We appreciated Laura’s professional demeanor, attention to detail and willingness to work with us in the planning and execution of a poolside barbecue event for 60-plus people at Playa Bonita Residences. Her prompt and personable responses to our many questions and concerns made her a pleasure to work with! We would not hesitate to hire her and her company to cater another affair. We also want to extend our thanks and appreciation to Chef Enrique and his assistant cooks and grill masters, who did an outstanding job providing our guests with a delicious meal…the quality and quantity of the food was impressive! Also kudos and thanks to Emilio, our bartender, who carried out his duties with charm and a smile for all. Thank you “Wicked Events” for helping to create a festive and memorable event for our families. The original texts can be found on our German website. …arrived home safe and sound after an amazing trip!! The country truly offers more than you would think, amazing landscapes and national parks, friendly people and of course beautiful beaches! We went on some different excursions we organized outside of the hotels (with street vendors or small offices) and it worked very well: it is not only more economic but also less complicated. The hotels always saw problems regarding my wheelchair (how to get on the boat etc. ), the locals always said “no problem”. Strolling through Santo Domingo´s Colonial Zone is very nice and the hotel was amazing. The pool on the roof was a great reward for the kids after a tour through the city, so the Billini Hotel is very recommendable and the staff is very nice and charming. Samana has gorgeous landscapes and the location of our hotel Grand Bahia Principe El Portillo was perfect, surrounded by pristine beaches and we spent hours swimming along the coast (with long stops at the beach, of course). I hope the coast stays this natural. The full day tour that started in Santa Barbara de Samana and then by catamaran through the national park Los Haitises was a dream! Great atmosphere on board, caves where my wife and kids walked through, true Caribbean feeling (we visited one of the film locations of “Pirates of the Caribbean”). On the way back we even made a stop on Cayo Levantado – amazing! Also the south of the Dominican Republic was beautiful, though totally different than Samana (a great contrast). We did an excursion on the river Chavon and to Saona Island – they took us to a pristine beach in the south east with only a few people from the tour, nature and the most beautiful beaches – incredible! I would like to thank you for all your efforts and the great information and tipps, everything ran smoothly and was perfectly organized (also the transfers were always there on time), the hotel selection was perfect too. You didn´t promise too much and all our expectations have been exceeded! I will definitely contact you again for our or our friend´s future travels. We thought long about any negative points about our wedding and honeymoon but couldn´t come up anything. Your suggestions – from hotels, villas or tips for excursions – were always exactly what we wanted. The only wish we have for other wedding couples is for them to be treated just as caring and warm-hearted as you treated us. If you keep this up, you do everything right. If we ever plan on coming back to the Dominican Republic, we will sure get in touch with Dominican Expert again. Thank you very much for everything you´ve done for us. cheers to you and Florian [executive chef] and your co-worker Ana [event planner]. Thanks for the good and elegant service last Monday (plated menu) and Wednesday (business dinner at the embassy and the pyramid cake). To start with the last thing: the pyramid cake was a full success and it was praised a lot. Those who ate it knew exactly that it was from the same producer as the exceptional dessert at your reception on the 16th of January 2013 because it had the same outstanding quality. Therefore we were able to do some advertising for you. A big thank you to Florian! The evening and the dinner have been a huge success. Thanks again for all your commitment. My thanks particularly to Florian Strahlheim, but also to the team for their remarkable efforts. Last but not least I would also like to thank you sincerely for the booking of the Sublime Samaná Hotel. I was really very satisfied. The original texts can be found on our Spanish website. Thanks to everyone. It is indeed a pleasure to work with such professionals who know what they are doing. I feel very pleased with the services of WICKED Events and Travel and MI CORAZON Catering. The food was delicious, we will even take some home to Switzerland. At the end we were around 65 participants and all of them were impressed by you. I will pass your information to everyone I know so that they can contact you. My special thanks to your executive chef, besides being excellent he is also a very nice person. The same for Ana [Event Planner of WICKED], it [the event] was very well set up, settled and organized. Indeed we were very pleased with your service. And to you, Montserrat, what shall I say – thanks for your tireless dedication and attention since the beginning. You were tied with this first dinner project of the Swiss Chamber of Commerce since it started and I am sure that it will continue with being a regular activity. Next year we will organize it even bigger with at least 100 persons, maybe in the Country Club. The food was phenomenal and the service exceptional. Thank you very much! We always hire WICKED Events and Travel and MI CORAZON Catering because they completely meet our expectations regarding their services and the price-value-ratio. Superb, well done, excellent service, good performance, perfect food and a nice presentation. Contact us!Have a look at our clients!